DEPAC component seal type 196 is a pressure balanced stationary single seal which has been developed especially to fit installation chambers according to DIN 24960 / EN 12756. The seal’s stationary seal design completely rules out seal or shaft fretting and guarantees smooth running. Balanced mechanical seals work with lower face pressure. This means lower face friction and therefore less wear on the face pair. The mechanical seal lasts longer! 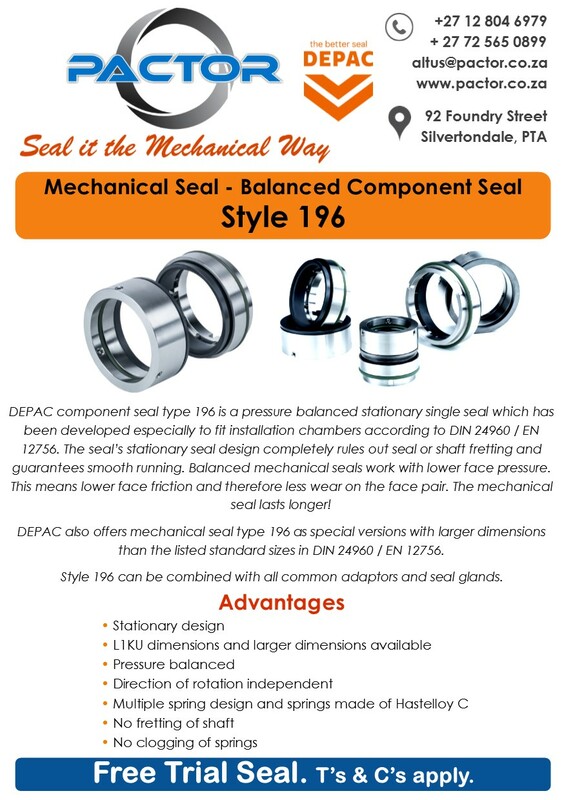 DEPAC also offers mechanical seal type 196 as special versions with larger dimensions than the listed standard sizes in DIN 24960 / EN 12756. Style 196 can be combined with all common adaptors and seal glands. Maximum temperature / pressure / speed indicates operating extremes independently and does not imply the seal will function at these extremes at the same time. Contact Pactor if in doubt.